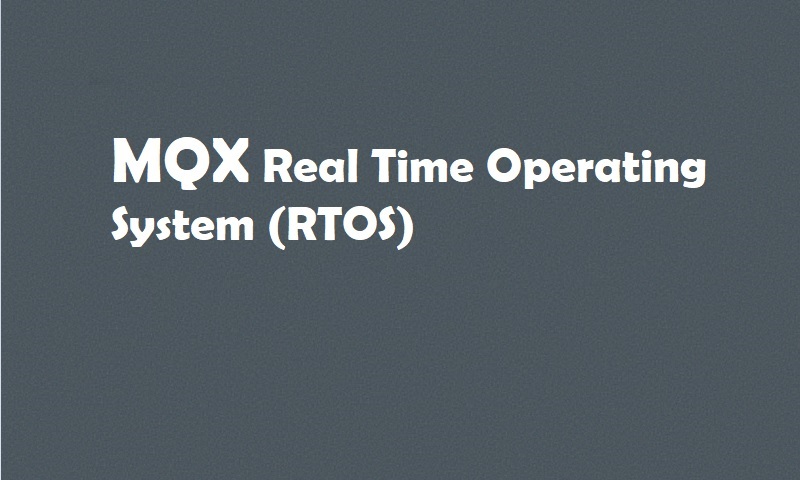 The MQX Real Time Operating System (RTOS) provides real-time performance within a small, configurable footprint. The RTOS is tightly integrated with 32-bit MCUs and MPUs from NXP and is provided with commonly used device drivers. The MQX RTOS is designed to have a modern, component-based microkernel architecture allowing for customization by feature, size, and speed by selecting the components engineers wish to include while meeting the tight memory constraints of embedded systems. Its configurable size conserves memory space taking as little as 6 KB of ROM, including its kernel, interrupts, semaphores, queues and a memory manager. MQX RTOS includes a TCP/IP stack (RTCS), embedded MS-DOS file system (MFS), USB Host/Device Stack, as well as Design, Task-Aware debugging (TAD), Remote debugging and performance analysis tools. It is supported by popular SSL/TLS libraries such as wolfSSL for increased security measures. MQX RTOS is generally used in embedded systems. MQX development is done on a “host” machine running Unix or Windows, cross-compiling target software to run on various “target” CPU architectures. MQX RTOS has been ported to a number of platforms and now runs on practically any modern CPU that is used in the embedded market. This includes Kinetis, ColdFire, PowerPC, ARC, ARM, StrongARM, xScale CPUs. All new Kinetis (ARM – CortexM4) and ColdFire devices are to be enabled with complimentary Freescale MQX RTOS. Freescale plans to expand the availability of this complimentary integrated enablement software to include many embedded processors in its broad portfolio. The MQX RTOS can be configured to take as little as 8 KB of ROM and 2.5K RAM on Arm ® Cortex M4, including kernel, 2 task applications,1 LW Semaphore, interrupt stack, queues, and memory manager. Provides a fully-functional RTOS core with additional, optional services. Components are linked in only if needed, preventing unused functions from bloating the memory footprint. Key components are included in both full and lightweight versions for further control of size, RAM/ROM utilization and performance options. Priority-based preemptive scheduling allows high-priority threads to meet their deadlines consistently, no matter how many other threads are competing for CPU time. Optimized assembly code to accelerates key real-time portions of the RTOS such as context switching. MQX RTOS provides the developer faster development time by relieving engineers from create or maintain an efficient scheduling system and interrupt handling. It is also significantly useful if one requires the use of multiple communication protocols like USB or TCP/IP. MQX RTOS provides a framework with a simple API to build and organize the features across NXP’s broad portfolio of embedded processors. Writing code for MQX RTOS is straight forward with a complete API and available reference documentation. A fast boot sequence ensures the application is running quickly after the hardware has been reset. Messages can be easily passed between tasks running on the same CPU or even a different CPU in the system.